The Xiaomi Redmi 2 is helping the company cross into the 64-bit era. A catchy enough headline for a sequel that's not overly generous with the upgrades. On second thought, a new generation chipset (lower-midrange but still), a more recent OS and LTE are not a package to frown on. Especially considering that the upgrade costs the same - if not less - than the predecessor. The Redmi 1S was a huge success with reasonable specs at an unbelievable price. The stakes are high for the successor and the Xiaomi Redmi 2 isn't trying to fix what wasn't broke. It carries over the sober looks losing some body fat without sacrificing the screen real estate and resolution. LTE connectivity on top of the original dual-SIM capability is welcome too. The elegant MIUI has been further refined as well. Xiaomi have redesigned the launcher, but the logic and functionality are intact - in a bid perhaps to keep both newcomers and upgraders happy. 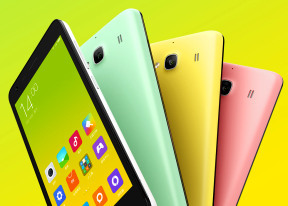 Xiaomi unveiled an upgraded 16GB model with 2GB of RAM just a month after the official announcement of the Redmi 2. It is slightly more expensive, but heavy multitaskers will certainly find the premium is worth it. The very early adopters may have been disappointed by the fast hardware upgrade, but we'd better have it than not. As usual, availability is an issue - not so much finding a vendor but the potential complications about servicing and warranty. The upside is you're not paying over the odds for hardware - you would normally need to reach much deeper in your wallet to get a package like that. With a price that's hard to beat and a realistic level of equipment, things are looking good so far for the Redmi 2. Find out what happens next right after the break! Am having a problem with my Redmi 2 my wi-fi, Bluetooth and fm radio it's not working what must I do please help me am really struggling about it.